Last night’s episode of Teen Mom 2 has given us the long-awaited conclusion of Jenelle Evans’ court battle for Jace. Spoiler alert: Jenelle doesn’t exactly get her way. 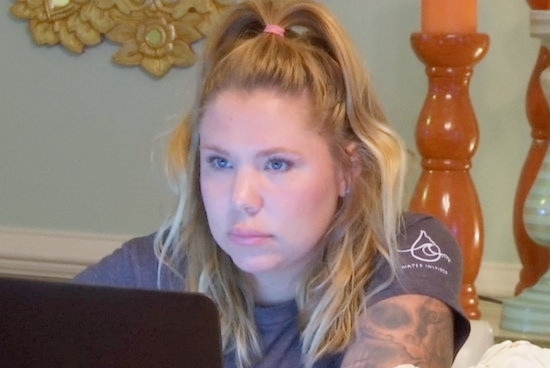 Speaking of court, Kailyn Lowry thought she could catch a break from it now that her divorce is finalized but her ex, Jo Rivera, has different plans and she finds herself speed dialing a lawyer again. The other Teen Moms have decidedly less drama so let’s start with them. Life is good for Chelsea DeBoer and husband Cole as they plan for their upcoming wedding reception and settle into life as a family of four. Chelsea meets her Dad downtown at her Stepmom’s shop to pick up the kids after Randy watched them last night. They talk about how Aubree is going to see Adam Lind for Father’s Day but Chelsea isn’t so sure she will actually do anything outside of seeing him. On the drive home, Chelsea asks Aubree if she’s excited to see her Dad and she says he always sleeps when she is there and never plays with him. 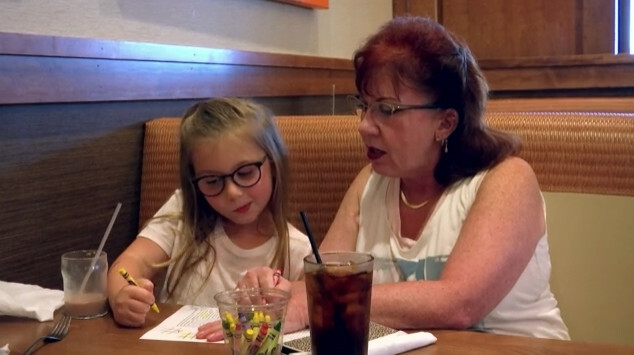 Tonight’s episode of Teen Mom 2 left me with more questions than answers when it comes to the state of affairs for Kailyn Lowry, Briana DeJesus and Jenelle Evans. It seems like everything is always up in the air and nothing is ever resolved in their lives. Starting with Kail, the ups and downs with ex-husband Javi Marroquin continue and ever since he filed for child support, they have been down. Despite the tension, Kail claims she is doing her best to make sure he sees the boys but when he can’t pick them up at the spot she designated, that quickly goes out the window. She decides to meet him in a parking lot that’s convenient for her but after a few texts from him, pulls off angrily and explains in detail to the boys that “Javi” (not Dad) doesn’t have the right car with car seats to pick them up so they have to come to school with her. OK, so if you tuned in for the supersized Teen Mom 2 last night, we are now on to the actual reunion portion of things, with hopefully ALL the teen moms. If you didn’t have the stomach for two hours (and believe me, I understand), check out my recap on the first half so you’re all caught up. You’re going to need it as a point of reference and really, that’s where all the action happened. Tonight’s reunion was pretty quiet in comparison. As Leah Messer and Kailyn Lowry get hair and makeup, Chelsea Houska is back on set after a fever yesterday and (surprise!) so is Jenelle Evans, who faked sick and stormed off set because she was mad at her mom. In the makeup chair, Jenelle defends herself and blames the producers again for her troubles with Barb. Under the watchful eye of Baby Daddy/Creepy Control Freak David Eason, Jenelle goes to film her intro on the reunion and when asked what her most positive trait is, she doesn’t have one but two for us: being well spoken and also, educated. HA! With that little gem, on with the show! Tonight’s episode of Teen Mom 2 is setting us up nicely for the season finale next week. Chelsea Houska and Cole DeBoer are getting hitched, Leah Messer is going back to school, Jenelle Evans is still battling mom Barb in court for custody of Jace and Kailyn Lowry and Javi Marroquin are still in the miserable stage of getting divorced, with no end in sight. So let’s get this recap on the road! Chelsea is going to get her marriage license in Nebraska and is pretty excited to be a wife. As she shares that with her mom and Aubree over lunch, her mom ruins it by telling Aubree that Cole will officially be her dad now. A confused Aubree asks how he can be her dad when she already has a deadbeat one (OK I added the deadbeat part) and Chelsea insists her mother stop. Instead, her mom takes it up a notch and asks Aubree if she calls Cole dad. Aubree gets annoyed and who could blame her. These are questions she should be handling on her own and it’s not up to anyone else to pressure Aubree into defining her relationships with the adults in her life. 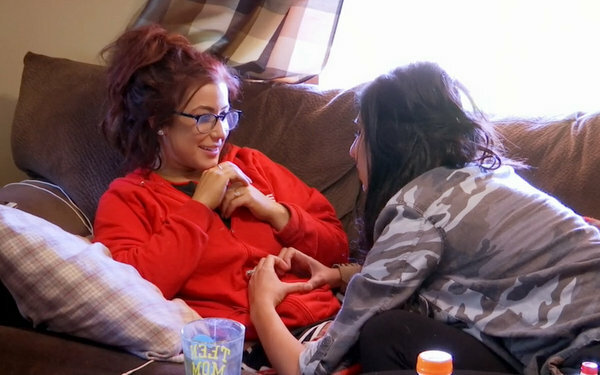 This week’s episode of Teen Mom 2 revolves around the self-created drama of both Kailyn Lowry and Jenelle Evans but what else is new? There are a lot of similarities between their two very different lives: both are selfish and over dramatic. But the similarities end when it comes to how they deal with things – Jenelle won’t shut up about whatever she thinks is going on and Kail refuses to talk about it unless it benefits her. This week, Kail is so wrapped up in going back to school, we’re only subjected to the drama she has left behind for Jo Rivera and Vee Torres, while Jenelle is busy with delusions of everyone vying for her affections. Leah Messer and Chelsea Houska get lost in the mix of these story lines, as usual. Yes, I know, reality TV is all about drama and things happening and it would be a pretty boring show if it weren’t for this, but nevertheless, it does get tiring to watch two people who are so emotionally stunted. On this episode of Teen Mom 2, Leah Messer finally takes the girls on the vacation she’s been talking about (to everyone but her exes), Chelsea Houska sends Aubree off to her first day of first grade, Kailyn Lowry officially files for divorce from Javi Marroquin, and Jenelle Evans decides to announce her pregnancy to the world that is already fully aware, thanks to a police report. Not surprising to anyone, Leah couldn’t get the kids’ passports back on time so her plans to go to Mexico are out of the question. Ex Jeremy Calvert is relieved to hear this, as he’s been worried from the jump about what a dangerous place a family-friendly resort on the coast of Mexico could be. So California it is! Despite the summer weather, an icy chill has fallen on this episode of Teen Mom 2. Well, for everyone but Chelsea Houska, who is excitedly expecting a baby with fiancé Cole DeBoer. All she needs is her social media announcement because as we all know, it’s not real until it’s Facebook official. Chelsea is feeling all the first trimester fun: nausea and tired, which is preventing her from taking a shower today. She’s also feeling anxious because it’s so early in her pregnancy and she can’t feel kicks yet. Luckily, she finds a heartbeat while using her home Doppler, so that helps ease some of her fears. A few days later, everything is confirmed by the doctor as a healthy pregnancy after Chelsea gets her first ultrasound.